I was six years old, and staying with my grandparents for Christmas vacation. My mother was a physician. She and my father planned to come for Christmas Day and New Year’s Day, and would take me home in time for school. I don’t want you to think I felt abandoned. Not at all. I’d spent my vacations with my grandparents all of my life, and was as comfy in my little room up under the eaves as I was twenty miles away in my pink room with the white frilly canopy bed that had been my heart’s desire two Christmases ago. With that bed, I felt like the luckiest girl ever. I leaned against my grandmother’s knees. She held an embroidery hoop on her lap and was embroidering linen guest towels for my mother. “That’s because she knows you like pink. You like the warm colors. She prefers the cold ones.” She concentrated a French knot. “I wish I could do that,” I said. I thought about what she’d said about my mother’s color preference. Slowly, I concluded that Granny was right. All the rooms in my parents’ house were white or pale tints of gray, green, or blue. Only my room was bright, beautiful pink, and it wasn’t because they hadn’t gotten around to painting the other rooms pink. That was the way they liked it. Maybe I could change their minds, but I’d already learned they were resistant to changing their minds. On Christmas Eve, I got Poppy to take me shopping. I knew just what Granny would like. I stood before the display of embroidery floss for a long time, choosing the right colors, then changing my mind, putting them back, and choosing them all over again. I ended up with shell pink, baby pink, hot pink, and fuschia. Up in my room that afternoon, I wrapped the tins of cookies I’d made (with Granny’s help) for my parents and for Poppy. I was almost more excited about the pink embroidery floss for Granny than I was about whatever might be under the tree for me the next day. My parents arrived. We had a Christmas Eve feast, and I was hustled off to bed. In the morning, I made Granny wait until last to open my present, and she gave me one from her to unwrap at the same time. “Floss,” I corrected him. I threw myself into Granny’s arms, and we all laughed. Granny laughed so hard she cried. 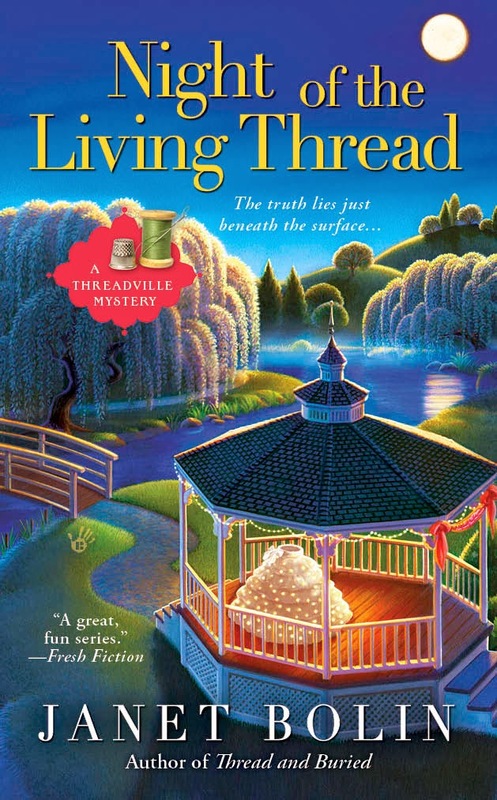 For a chance to win a copy of a Threadville Mystery (your choice) during our Season's Reading celebration, leave a comment below. 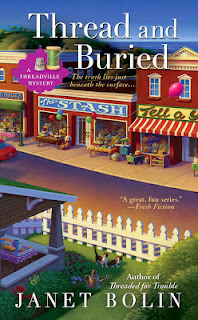 You can read about how Willow solves a murder in the latest Threadville Mystery, THREAD AND BURIED, available from these booksellers. Read the first chapter here. 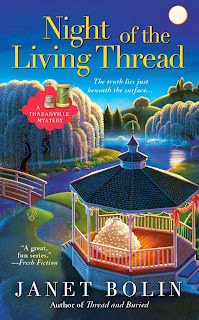 Janet's next Threadville Mystery, NIGHT OF THE LIVING THREAD, comes out next June. Sounds like another winner! Thanks for great reading opportunities Lynn/MI! Grandparents are always good to spend time with. I have read the first two Threadville mysteries and enjoyed them very much. Embroidery continues to be one of my favorite craft activities. I need to do some catch-up on this series.....really enjoyed the 1st book!!! Awww! I loved this post. Brings back memories of learning to crochet from my grandmother. I love reading about people's Christmas memories. I used to cross stitch. Maybe someday I'll pick it up again! I really enjoyed these books. They have me dreaming of an embroidery machine once the kids are out of the house in a few years. I need to find a place to start taking lessons soon! I would so love to be your winner! “Thread and Buried” sounds wonderful! I would love to read/review and promote it on our blog, bookworm2bookworm. Thank you for the generous giveaway! Love the way this book sounds. Looking forward to the newest book. Love this series. I would absolutely L O V E to read this series. Hope I get picked! Somewhere I have embroidery floss and iron-on patterns stashed away from the 60s. Time to finally clean out the back of that hard to get into closet! Just finished Thread and Buried - thumbs up! I have not read any of the books in this series but they sound fun! Grandmothers are so special, I hope we learn more about Willow's family in the book. A new to me series that I must read now. Thanks for the giveaway! Grandparents are the best! Love this series! Next June is to far away! My aunt gave me a sewing kit when I was about 7 or 8. I still have it in the closet, including hoops for doing cross stitch and floss. But mostly I use it for sewing buttons back on! and making the ocassional Halloween costume. In fact, I think there's still some "cow hide" fabric from when I made a vest for my son/Woody from Toy Story. I have the first two in the series so if I win I'll pick the third one. Love the cover of the one to be released in June. I can do embroidery, but only the stamped kind with the X's. I don't have a sewing machine but I can sew on buttons and repair items. That was just lovely thank you. My Mother taught me how to embroider. I still enjoy it. I loved sitting next to my grandmother and watching her sew. I did get a little sewing basket, I still have it, green and white and it holds my emergency sewing needs. My poor grandmother never had such a poor student. She did a great job with my mother, but not with me. She was left handed and I was right (so is my mother), and for some reason I never could take to doing some of the stitches. I do the backstitch backwards (think about it, it is another stitch). I did learn the blanket stitch and do that very well. When I was in my 20s I did a complete sampler from my own design - never touched cross stitching again. I did crewel work and needle point and just about everything that did not require a sewing machine. In the end I decided to stick with knitting the thing I do the best. But I treasure the memories of sitting by my grandmother and watching her piece quilts or decorate clothing. I learned to embroider from my grandmother also. I was older than six. I learned to embroider at my mom's knee and my granny's too..I was possibly 5 yrs old..still embroider to this day..very relaxing, and a fun thing to do.....Interesting series this...had me at "thread"!! Thank you, everyone! I enjoyed reading your comments! I'm right-handed, my mother was left-handed, and her mother was right-handed. I'm third generation confused. The random number generator chose LibbyDodd as a winner of a Threadville Mystery. Congratulations, Libby, and write to me at Janet at ThreadvilleMysteries.com with your address, and I'll send you a Threadville Mystery of your choice.